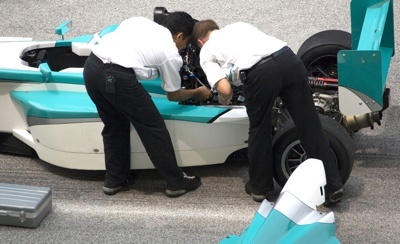 Race teams face significant time constraints with regard to tuning their cars outside of race events. Tight schedules (a top NASCAR Sprint Cup team faces 39 races in 40 weeks), out-of-competition test-time restrictions (IMSA GT Daytona teams are permitted only four private test days per calendar year, for example), limited race weekend practice time, and the complexity of a vehicle’s on-board systems all conspire to make it difficult for engineers, crew chiefs, and drivers to spend adequate time tuning and practicing with their vehicles prior to race events. To overcome this, most top teams rely upon a combination of simulation and rig testing with differing levels of sophistication. Such an approach is aimed at reducing the amount of trial-and-error tuning, and it can lead to sensible starting setups upon arrival at a track. However, the results can sometimes be less than satisfactory. Despite the best planning and preparation, a driver might climb out of a car after just a few laps and deem it “un-drivable.” This leaves race engineers in the difficult position of having to chase tuning options on the fly within a finite practice and qualifying window. This is not the optimal process for tuning a highly sophisticated, sensitive vehicle with millions of prize and sponsorship dollars at stake. Testing ahead of time on a DIL simulator relaxes some of the time restrictions because the setups have already been explored, and the window of possibilities is contained. Also, DIL simulation gets real drivers involved early in the process, so the risk of nasty surprises is reduced when he or she finally gets behind the wheel of the real car. Tuning a racecar to perform at its best at a given venue requires consideration of historical data, weather variability, track surface conditions, and a number of other factors. You might have the science and resources to back you up, but you only have historical data about how the car behaves in a specific set of conditions. Even if the car is identical to a previous outing, it is unlikely that the environmental conditions will be the similar. Pre-testing in an engineering class DIL simulator lab enables exploration of different track and environmental conditions long before you pack the truck and head for the racetrack. Explorations can include variations in weather, tire degradation, fuel consumption, track surface temperature or rubbering, and other “wild cards.” Expanding the knowledge bank in advance allows zeroing in on baseline setups for the many different scenarios that may be encountered, meaning at-track changes can then be confined to fine-tuning areas. We speak a lot about computer simulations (software) and vehicle changes (hardware), but the human element is an often-overlooked factor. Ultimately, a driver is expected to extract maximum performance from a racecar. And a solid personal relationship between a driver and race engineer is a key part of this performance; a special language develops in communications between the two, and the more time they spend together, the more effective they will be as partners. As described above, track test days are limited, as is on-track time during practice and qualifying. Unfortunately, this reduces the available time engineers and drivers to forge the working relationships that will pay dividends on race day. However, a properly configured driving simulator laboratory replicates the track environment and enables drivers and engineers to nurture their relationships – if only by multiplying the number of hours spent working together. The newer engineering class DIL simulators feature open, flexible architectures, enabling connectivity to real world tools (telemetry, etc. ), and replication of race day situations. Drivers can interact with real vehicle controls and communication systems and immerse themselves in a driving experience as close to the real thing as possible. Simultaneously, engineers can monitor and collect vehicle performance data, just as they would track-side. And, of course, all of this is just the tip of the iceberg. Since all of this is taking place in a controlled laboratory environment, there is an unparalleled ability to explore what-ifs, and map out beneficial strategies, well in advance of race day.